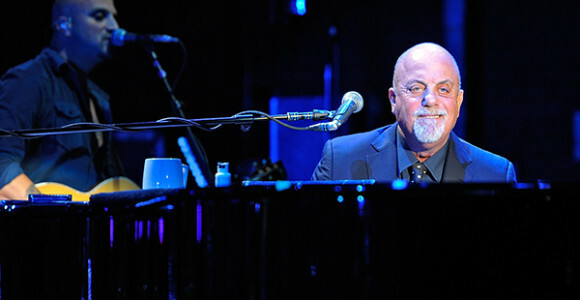 [from Billboard Magazine, December 3, 2013] This past Tuesday singer-songwriter Billy Joel announced he will be taking up residency at his beloved Madison Square Garden in New York City. Four shows have already sold-out on the dates of Jan. 27, Feb. 3, March 21 and April 28. Tickets for his May 9 show, also Joel’s 65th birthday, will go on sale Saturday. Joel ended a three-year break from performing with a concert at Madison Square Garden benefiting victims of Hurricane Sandy last year on 12-12-12. For the 2013 year, the legendary performer has been on the stage at Australia’s Stone Music Festival, New Orleans Jazz & Heritage Festival as well as a brief United Kingdom tour that ended on Nov. 8 (his first since 2006). In October Joel played his first Long Island concert in 11 years to benefit Long Island Cares, the Hauppauge-based charity founded by Harry Chapin. Joel will be receiving the Kennedy Center Honor on December 8 and is scheduled to perform at the Madison Square Garden rival, Barlcays Center in Brooklyn, on New Years Eve.